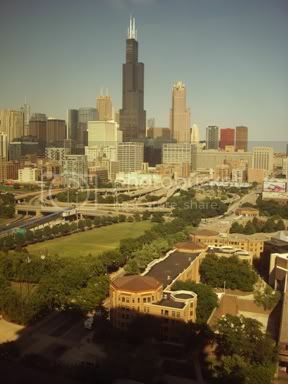 I teach full-time at a university here in Chicago, and it's my absolute dream job - I love everything about it, from the amazing students to the fascinating material to the office with the incredible view. It may seem hyperbolic, but I can't rave enough about how happy teaching makes me. I love every single day. Even on the days when I'm completely exhausted, stressed, and a little frustrated, I'm still incredibly in love with working here and wouldn't trade it for the world. The past few weeks have fallen under that description since we're in the middle of the term, and for my students it seems that Spring Break can't come quickly enough. They have papers, exams, and projects in every class due around the same time, and that means they all show up to class completely worn out and unmotivated. Since so much of my time will be devoted to work this week, I'm trying to find quick and delicious recipes for weeknights. After teaching, office hours, and hitting the gym, I want something tasty that will be ready in a short time. 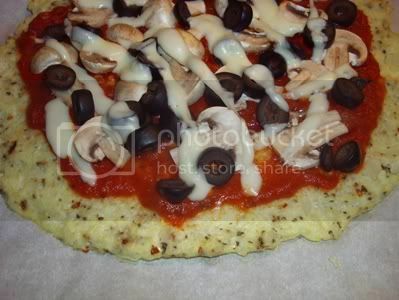 The other night, I was completely exhausted and craving something saucy, and I thought about a recipe for cauliflower pizza that I read about a while ago on Lyn's blog. Perfect! I usually post recipes on Sundays, but this was so delicious that I simply could not wait. As usual, I changed the recipe a little to suit my own personal needs and tastes. Here is my version - with pictures! Preheat your oven to 440ºF. Mix together a cup and a half of grated cauliflower, 1 egg, and some spices - I did 2 teaspoons each of dried basil and red pepper flakes. Spread the mixture on a cookie sheet - be sure to either spray it with non-stick cooking spray or use a piece of parchment paper. I used the paper since I had it in the house. Bake for 12-15 minutes or until it is brown. Mine didn't look nearly as brown as Lyn's did, even after I cooked it an extra five minutes. Maybe because I skipped her step of adding cheese to the crust? Oh, well. It held together, so I carried on. 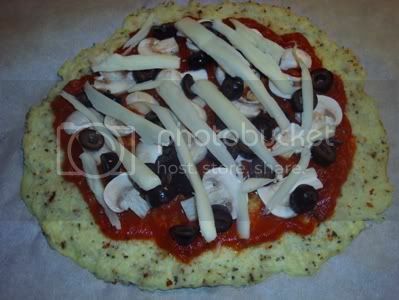 Top the "crust" with some tomato sauce and whatever toppings you would like - I did fresh mushrooms, sliced olives, and a piece of string cheese. Put it back in the oven for about 5 minutes or until the cheese is melted. All melted and nice! And ready to serve. Lyn said hers was strong enough to pick up and eat like "real" pizza - next time, I'm going to try baking the heck out of mine, because I had to just eat mine off a plate with a fork. No real complaints, though - it was incredibly tasty and totally quick to make. Preparing the cauliflower was fast with my food processor, and it completely satisfied my want for saucy pizza-y goodness. Definitely a keeper. I'll be revisiting this one soon enough and trying new things with it. Especially since this whole pizza only had about 300 calories! Perfection. What about you? What's your favorite quick weeknight meal? OMG that looks so good... 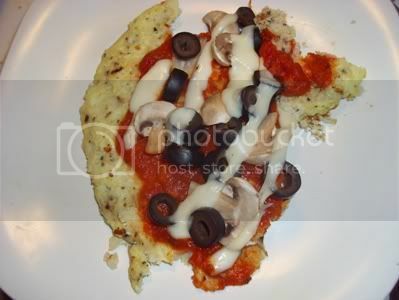 I've been hearing about this cauliflower pizza everywhere it seems... and I need to try it. My quick meal is always a salad... but lately I have to admit we've been making a lot of Naan pizzas - which are more calories than the cauliflower, but still good for you. That sounds interesting enough to try. Thanks for posting. This is such a great idea. I will have to give this a try. I heart pizza! I have made cauliflower pizza too! I love it, still haven't perfected the art of the crispy crust but it really does hit the spot! Love, love Chicago. One of my favorite cities. 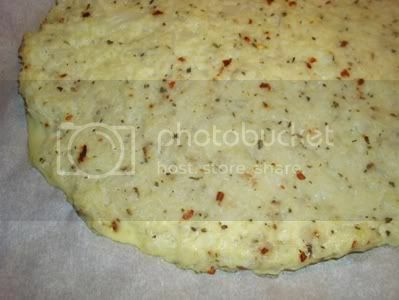 This pizza looks like something I am going to have to make. I'm really into trying different things and I am amazed at the recipes people come up with. I'd never have thought this up by myself. Thank you for sharing! OH.YUM. Thanks for sharing this and the link! I will try it.